This level of playfulness is achieved by thoughtfully combining Specialized's full FACT 9m carbon fiber Trail Chassis with their M5 alloy Camber FSR rear end. At both ends of the bike, you'll find that its nimble wheel size gives a little extra travel length to deliver plenty of plush suspension—all without going overboard on big hit capability. This means that you don't have to sacrifice efficiency, weight, or sheer speed to ride how you want. 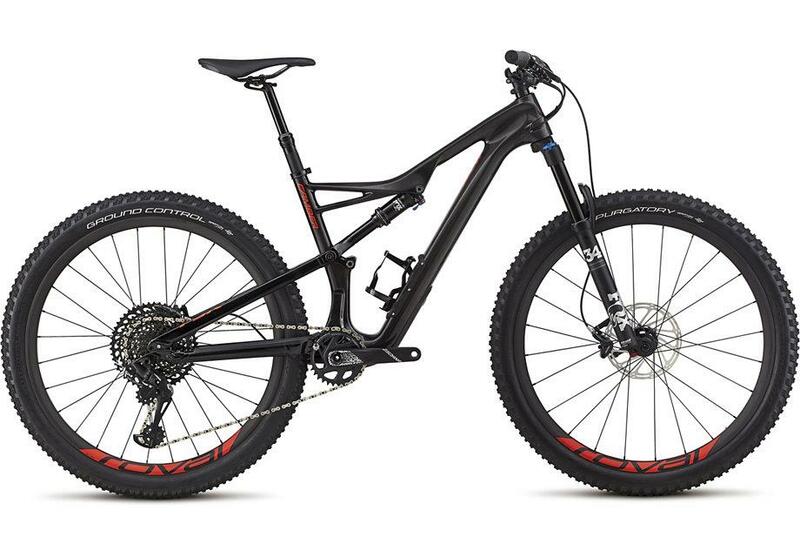 And with Specialized's Trail 27.5 Geometry and lightweight, stiff, and smooth Concentric Pivot at the rear, they can guarantee it. The other trail component of the Camber is utility, and along these lines, it features our fully integrated SWAT™ Door at the down tube of the frame. Open it up, and you're able to safely and securely house your ride essentials right where you want them—on the bike. For the build, Specialized selected an excellent spec with components like 12-speed SRAM GX Eagle, SRAM Level TL brakes, a FOX 34 fork with a ultra-stiff stanchions, a custom-tuned FOX FLOAT rear shock, and Roval Traverse Carbon rims laced to our own hubs.